Need a hint? They are all recipients of our culture’s one-off characterizations. They are identity groups that have been used as Republican proxies. I had posted on this phenomenon a few years ago. When our culture criticizes gun owners, or stigmatizes the Tea Party, it is using a time-honored technique. Hatred of individuals is shielded from scrutiny when it is an identity group that is being criticized. Gun owners are killers. Who likes killers? Tea Party activists are racists. Who likes racists? “The 1%” are greedy. Who likes greedy people? Climate skeptics are all of the above. Who likes them? You get the idea. People may characterize these groups without appearing to be totally anti-Republican. It gives political cover. And isn’t that convenient? Maybe that’s why we should note the press reaction associated with two recent events. One was Mitt Romney offering a $10,000 wager to Rick Perry at a debate. 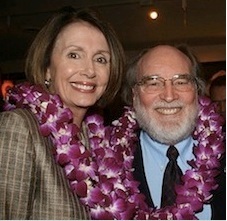 The other was Nancy Pelosi taking a Christmas vacation in Hawaii at the Four Seasons Resort Hualalai. Mitt Romney’s bet was characterized as an indication of his out-of-touch style and arrogance. Nancy Pelosi’s vacation coverage noted that she attended midnight mass at St. Michael’s Catholic Church. I would imagine both politicians (with well over $100 million in wealth) are in that “1%.” But one of them receives more accommodating press coverage. Why is that? There is no need to answer the question. The point is that “The 1%” is meant to target Republicans. Nancy Pelosi, John Kerry and Jon Corzine might technically be in the 1% category, but their righteousness keeps them from being classified as greedy. That characterization is reserved for Republicans by way of an identity group. As long as Republicans accept this as what is “right and natural,” nothing will change. But who knows? There is a deferring/dominant psychological pattern where individuals put up with abuse for a certain amount of time and then try to turn the tables. In America, we have elections for that sort of thing. 2012 might just become the year that Republicans gain a measure of (reluctant) respectability from our American culture.